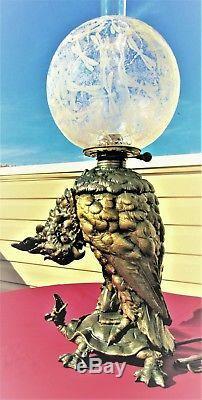 Offering this Very Rare and Beautiful Victorian Cockatoo oil lamp made in Ballard Vale, Massachusetts Ca: 1870. 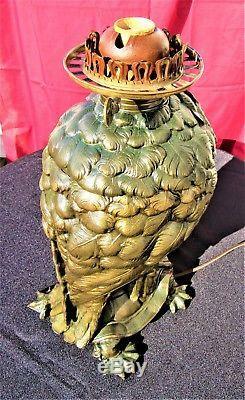 Please note: What makes this Oil Lamp even more rare then others, is the fact that the factory that made them, burned to the ground soon after the turn of the 20th Century. The factory was never rebuilt and the lamps were made in limited numbers, and never reproduced again. 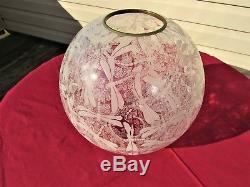 16" tall (to top of burner) X 7" wide (widest point) X 12 deep (cockatoos head to its tail) The etched glass Dragon Fly Globe is aprox. 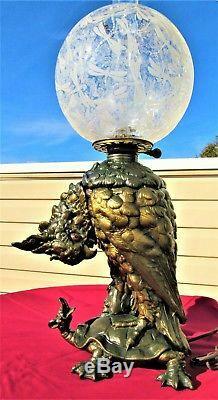 To even find one of these Cockatoo Lamps is very difficult. To find one in this Condition, with much of its Original gilded Gold finish still remaining, is even more difficult (many were stripped of their original finishes, or painted over). 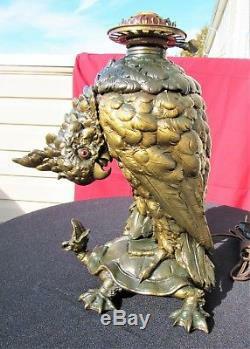 Then, to find this Cockatoo Oil Lamp, with it's Original Dragon Fly Shade- Could be a once in a life time. 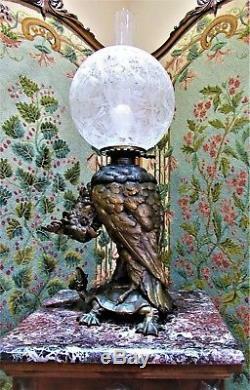 The hand blown glass shade fits in with the nature theme of the lamp perfectly (having a Bird and Turtle) and looks appropriate and stunning together. 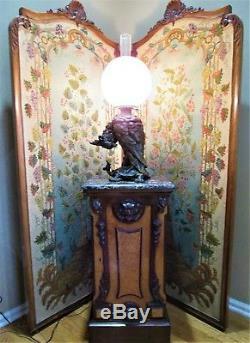 Many old oil lamps don't have their original shades; the reason for this is the fact that so many of the original glass shades were broken, while being lit, cleaned, or transported over the years. Replacement shades for oil lamps were reproduced in large numbers, and many are still being made today. The etched Dragon Fly shade really compliments the beauty and detail of the lamp base. I had three different on line experts claiming this lamp was made with three different types of shades. They can all be correct; the fact of the matter is when many (and all types) of oil lamps were made, many factories had special orders for the lamps; for libraries, theatres , gifts, friends.... The detail in the casting of the Cockatoo (which is very important) doesn't appear to be the best. The paint appears to have been either touched up, and or repainted over the years. 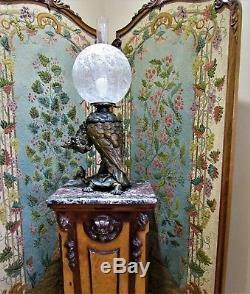 The etched Glass Globe on the lamp is attractive (and probably is original), but it just doesn't appear to be proportionately the right size for the lamp. The description states that the lamp has never been wired. This lamp has been professionally wired using the old style cloth lamp cord; making it practicle, useful, and more then just a conversation piece! 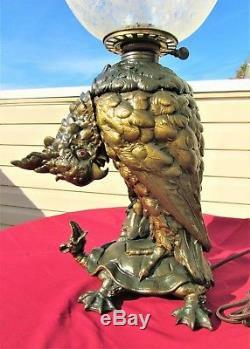 This Cockatoo Oil lamp was made by CRAIGHEAD & KINTZ, in the fourth Quarter of the 19th Century (Ca:1870). Different companies like Bradley & Hubbard put their burners on them, as well as Plume & Atwood. 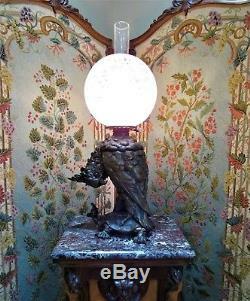 This lamp came from a Estate Buyout of a small lamp collection, that I acquired aprox. As an old collector- You always want to keep "The Best, of The Best" for yourself. When it's lit up it just Glows with Beauty. Please: No offers on this Lamp until the 30 days are up! This Rare Oil L amp will be handled with the utmost care, professionally packed, double boxed, and fully insured; to assure it gets to you, in the same exact condition it left me. Thank You For Viewing My Item For Sale! 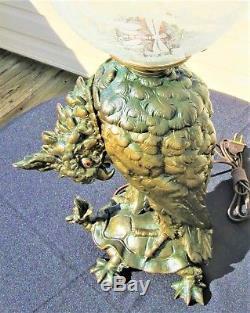 The item "Rare 1870 CRAIGHEAD & KINTZ Cockatoo Oil Lamp w Stunning Etched Dragon Fly Globe" is in sale since Saturday, December 1, 2018. This item is in the category "Antiques\Decorative Arts\Lamps". 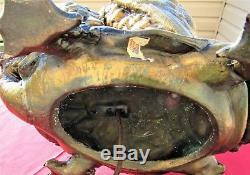 The seller is "itsakeepr" and is located in Pompton Lakes, New Jersey. This item can be shipped worldwide.